Your baby's car seat is one of the most important products you will use to keep your little one safe. Here's everything you need to know about car seats and car seat safety for your baby. Infant car seat. An infant car seat is designed for infants to use and can only be placed rear-facing. These types of car seats usually latch into a base that remains in the car and has a handle to make the seat more convenient for carrying and getting in and out of the vehicle. You will have to check the specific car seat for weight and height limits. Convertible car seat. Convertible car seats are designed to be used both for newborns and older babies. Most models can handle between 35 and 45 pounds and are designed for extended rear-facing. Unlike infant car seats, however, convertible car seats remain in the car so they can't be used as a carrier. Know your state's laws. The exact laws on how old your child must be to use a car seat and what height and weight restrictions there are for car seats varies by state. Check your state's specific car seat laws to be sure that you are following all of the proper rules and regulations. Do not let your baby sleep in a car seat. 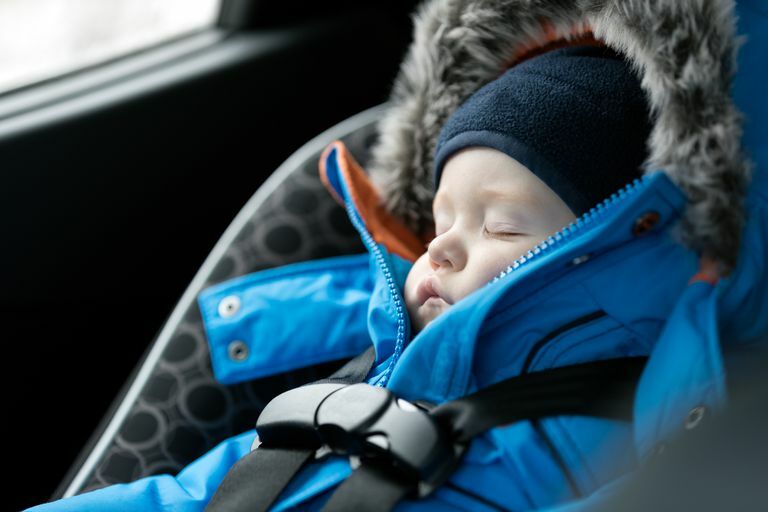 As tempting as it might be to allow your baby to take a snooze in his/her car seat, it is always safer to place the baby to sleep on his/her back in a crib, without any blankets or stuffed animals. Do not place a car seat on top of a grocery cart. Even if your car seat "clicks" into place on top of the grocery cart, it's not designed to be secure there. A car seat on top of a cart puts the baby at risk for falling off of the cart or making the cart tip over, causing serious harm to your baby. Always buy a car seat new. You should not accept used car seats or purchase second-hand one. Car seats do expire and can become defective with improper use or as a result of a car accident. You have probably seen a lot of information online about rear-facing car seats. Maybe you're confused on the exact guidelines. How long is too long? Is there a limit for rear-facing car seats? What is best for your baby? The bottom line is that the American Academy of Pediatrics recommends that all babies be rear-facing until at least two years old, providing that they fit the recommended height and weight restrictions on the car seat they are using. Most car seats are now designed to help a child be rear-facing as long as possible, but you should always check the weight and height limits, just in case. It is safest for all infants and toddlers to be rear-facing and, if your car seat allows it, to keep them rear-facing even past the age of two. There are now car seats on the market that will allow you to keep children who weigh as much as 50 pounds rear-facing. Even though you might worry about your child being uncomfortable rear-facing, it might help to keep in mind that if your child is rear-facing from the beginning, it will feel normal to him/her to remain rear-facing. Children usually adapt to folding their legs as they grow. And it is still safer for them to fold their legs and remain rear-facing then to face front providing their car seat's weight limits allow it. It may also ease your mind to invest in a car seat mirror so that you can see your child from the front seat. In general, know your state's laws and, if you can, invest in a high-quality car seat from the beginning that will allow you to keep your child rear-facing as long as possible to stay safer.